THE Duke and Duchess of Cambridge have announced that their second child is called Charlotte Elizabeth Diana. The girl, who was born on Saturday 2 May, weighing 8lbs 3oz. The Duchess went into labour shortly after 6am on Saturday morning, and gave birth to the girl at 8.34am. Her full title is HRH Princess Charlotte of Cambridge. The family have relocated to Kensington Palace following the birth, and all are said to be doing well. Kensington Palace confirmed the news via Twitter. Charlotte was the bookies' favourite name, with Elizabeth and Diana also in the running. Princess Charlotte is fourth in line to the throne, following Prince Charles, her father Prince William, and her brother Prince George. SO WHAT DO THE NAMES MEAN? THE Duke and Duchess of Cambridge won't call their new baby girl Diana, a friend has claimed. The new princess was born at 8.34am yesterday morning and a pal of the royal couple has said they are unlikely to use the baby's name to pay tribute to Prince William's late mother. The insider told PEOPLE magazine: "I think they're more traditional than that. I would think they would go with a more royal name. I love the idea of Alice. "I wouldn't read anything into [them not using Diana] - just that they'll go for a royal name." 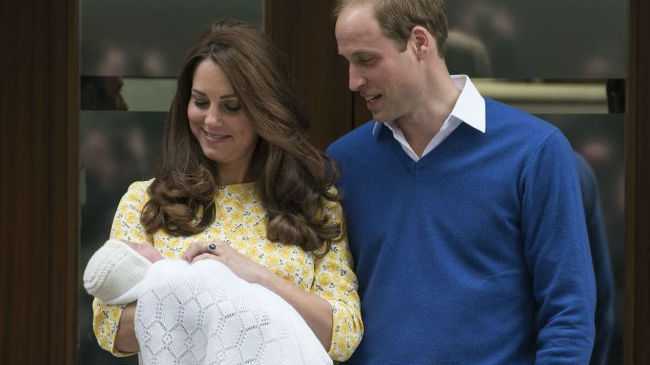 With the bookmakers, Charlotte is currently the favourite name for the royal baby, who is fourth in line to the throne. British bookmaker Paddy Power slashed the odds last night to 3/1, whilst Alice is second favourite with odds of 4/1. Elsewhere in the top 10 favourite names, it includes tributes to the little tot's great grandmother, with Elizabeth (8/1) and Diana, which is at odds of 10/1. Victoria (5/1), Olivia (5/1), Alexandra (14/1) and Mary (20/1) also made the top ten. Prince William, Kate Middleton, their 21-month-old son Prince George and the newborn have been at Kensington Palace, London today (03.05.15) where they have received visits from the Prince of Wales and the Duchess of Cornwall as well as the Middleton family - Kate's parents Michael and Carole and sister Pippa. How will the Princess live compared to the rest of us?